With interest rates at historic lows, financial institutions are relying on retail deposit fees more than ever. LOUISVILLE, KY (December 1, 2015)–BSG Financial Group, a group of independently organized companies that provides revenue-enhancing programs and compliance solutions for financial institutions nationwide, announced today that it will host a webinar for financial institutions entitled, "Managing Deposit Fees: Price With Precision to Save Time & Increase Income." The free webinar will be offered in two sessions: Tuesday, December 8, 2015 at 11:00 am EST and Thursday, December 10, 2015 at 2:00 pm EST. 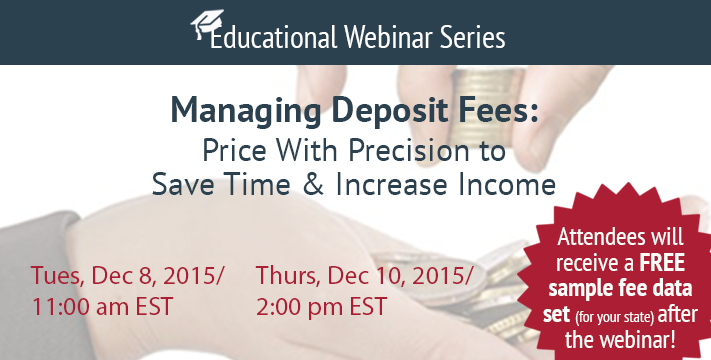 With interest rates at historic lows, financial institutions are relying on retail deposit fees more than ever. In fact, experts say that 70 percent of revenue for community banks comes from non-interest income. Overdraft fees have made up the lion’s share of non-interest income, and financial institutions are seeking fee strategies as the Consumer Financial Protection Bureau (CFPB) prepares to issue new overdraft guidelines. The webinar—especially relevant to financial institution marketing, retail, and financial officers—will provide tips and strategies to help financial institutions accurately set retail deposit fees to stay ahead of the competition and maximize non-interest income. The webinar is part of an ongoing educational series that BSG Financial Group provides for its clients and potential customers. It will feature speakers from Market Rates Insight, a financial services research firm that provides competitive market intelligence. Attendees to the webinar will also receive a free sample fee data set for their state after the webinar. Instructions for receiving the free pricing data will be discussed during the webinar. Louisville, Ky.-based BSG Financial Group is a group of independently organized companies that provides revenue-enhancing programs—combined with compliance solutions—for financial institutions to help them meet their financial goals. BSG Financial Group has been a provider of innovative overdraft programs since 1999, including the industry's first cloud-based overdraft management solution, Courtesy Connect(R)/Courtesy Limit™. The company's additional revenue-enhancing solutions include: Demand Deposit Account Management; Fee-Based Packaged Checking Accounts; Expense Management & Vendor Negotiation; Vendor Management; Social Media Management; and Appraisal Management Services. For over 30 years, Market Rates Insight has helped banking executives make better informed pricing decisions. The company serves banks and credit unions nationally with competitive information on deposits, consumer loans, mortgages, and fees. Market Rates Insight provides the most granular historical and refresh pricing data in the industry, helping financial decision makers plan and prepare for likely changes in rates and products. The company’s cloud-based system provides timely and precise competitive data supported by usable graphs and charts. Market Rates Insight is located in San Anselmo, California. For more information, see http://www.marketratesinsight.com.